Content marketing gets real results for your business. It builds trust, generates ROI and sales. 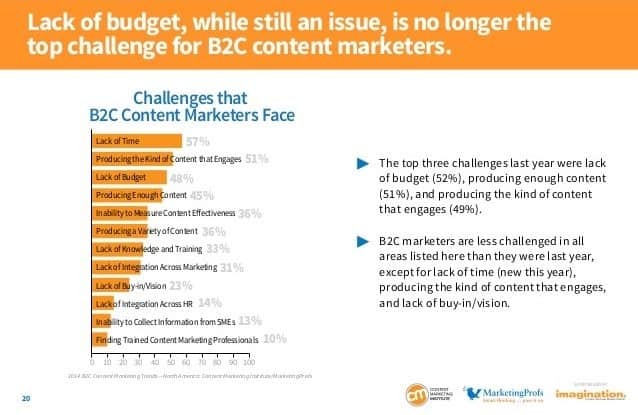 Can you guess the number one challenge content managers have identified? So what’s the solution? How to deal with the lack of time? Well, as you know, content can be original or curated. Original content has a higher value than filler content, but the curated content has a crucial, yet underestimated, role in your content mix. Let’s say; you add a new friend on Facebook. Do you only judge his character by his original status updates? Or perhaps, also by the things he finds and chooses to share? Of course, both. Thus, the real value of your content lies in its collection. You can even curate yourself a profitable business! For example, Ross Hudgens, the founder of Siege Media explains how curating content was the key to his success. He started sharing content on Twitter that helped him form relationships with influential people. As a result, he got more followers who then started consuming his original content. Thus, content curation is a great social media strategy for new businesses. Content curation isn’t exactly a child’s play either. According to Shoudmeloud, the proper curation process consists of “finding, tagging, rating, commenting, updating and contextualizing content.” So, like with everything else, curation only builds value if done right. It consists of 10 awesome content curation tools in 5 different stages to get in the process step by step. From reading your morning newsletter to combining your unique insights with the curated material. So, let’s get you curating! Grow your business, brand or message with content. Leverage content to turn strangers into customers. Reach your ideal audience quickly and easily. Discover low-cost and no-cost ways to reach massive numbers of people. Build a powerful and profitable email list so you can automate your marketing using autoresponders and other online tools. 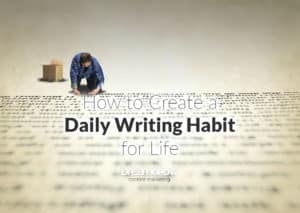 Step 1 – start consuming content! Pocket is a great app to get you in the habit of collecting content in one place. Save all sorts of content from your browser or from apps like Twitter, Flipboard and Pulse. Pocket integrates with over 1500 apps and is available for most major platforms. Once the content is in Pocket, it’s available on your phone or computer even if you don’t have a web connection. So you can read and share the content later. Start with the good old newsletter! As a content curator, it is important to keep yourself up-to-date with the everyday news. Being in the know forms the wider context of your content and your business. Plus, topical subjects can also give inspiration for original posts. The Quartz Daily Brief is the perfect source for that. While drinking your morning coffee, discover the latest news about finance, politics, and markets. Quartz presents news in a fun and chatty way, and as the name reveals, the overview is brief! Step 2- get into site-specific content! The Tweeted times allows you to discover and publish great tweets. It finds and curates niche content that is most relevant and fresh to your audience. The Tweeted times also shares news in your Twitter stream automatically. The tweets are then ranked by popularity. 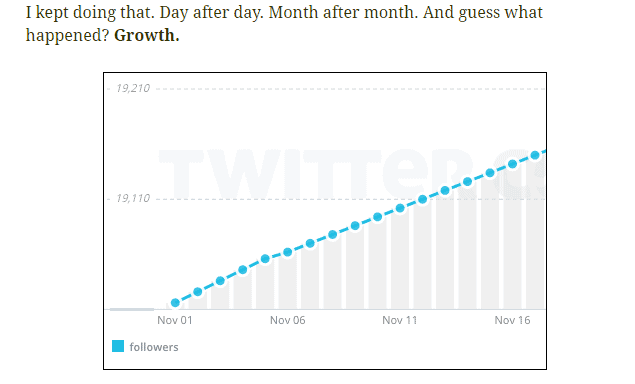 This real-time Twitter newspaper is perfect for new businesses to grow their community. And brings you one step closer to becoming a thought leader. Pinterest is the best platform for curating beautiful and inspiring content. From food recipes to home decoration, this platform offers a variety of filler ideas. Pinterest also enables you to organize and share all the content you can find. Plus, you can draw inspiration from different Pinboards for creating your own posts. For instance, Pinterest is a good source of infographics. Step 3 – curate relevant content! Feedly is the most popular RSS and blog reader in the world, and a must-have in content curation. You can subscibe to your favorite websites, publications, blogs and YouTube channels. Read the content in a distraction free mode, save it for later or share it easily on social media. Feedly also allows you to organize your feeds into collections. It’s free of charge but paid version allows logins with your team. DrumUp is the world’s leading social media and content marketing app. It can cut Twitter, Facebook, and LinkedIn management time up to 90%! DrumUp goes through tons of content across the web and gives you the freshest and most relevant stories. You can add many social media accounts to your dashboard and link your blog to social accounts. DrumUp up also enables you to set influential posts to repeat schedules. Trapit saves content from over 100,000 sources including blogs, professional journals, videos and podcasts. It has special algorithms that present you only with the most relevant content. You get the combination of the latest, trending, quality and hard-to-find information. Plus, the app can learn about your preferences when you vote on the stories you want. Trapit can make your curated content really stand out. Step 4 – organize your content! Pearltrees is like your digital library. You can collect web pages, photos and notes about the things you like. Simply drag your URLs and other digital objects, and organize them into collections and sub-collections. Your collections are visible to everyone and connected to other collections with common elements. So, Pearltrees also forms a social curation community. It helps you find rare content and collaborate in teams for better results. Who doesn’t love lists? According to List.ly founder Shyam Subramanyan, 30% of all web content are lists or contain list content. Thus, List.ly allows you to create short, well-curated and organized lists for your audience. Plus, it’s social! People can vote up or down on your list elements, add items, and even embed a list into their own site. So the lists are always updated and improved to remain relevant and useful for your readers. Step 5 – tell a story with your content! If you’re serious about content curation and in it for the long run, use Storify. Its half blog, half social media that blends original content with socially distributed material. You can pin content and display at-a-glance views of key story events. Storify has simple editing tools and various news sections such business, design, technology. It’s a clever way of combining your own narrative with crowdsourcing. 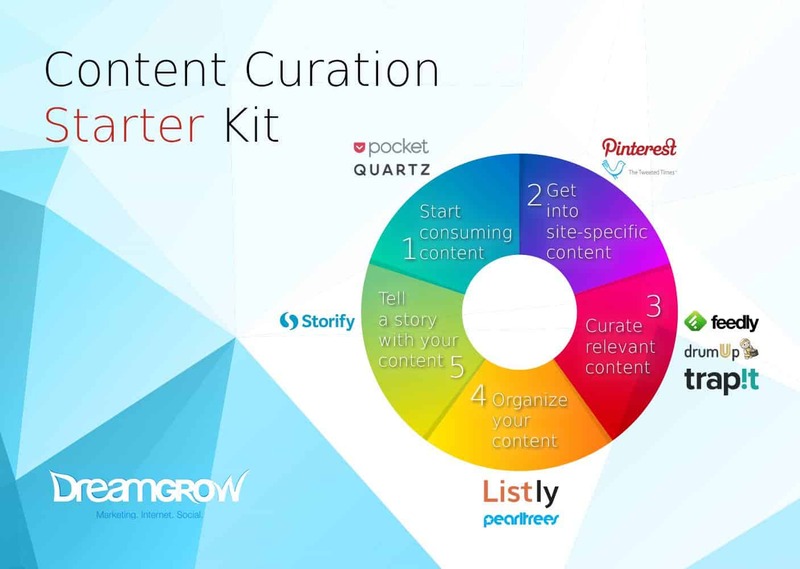 Hope you found this kit useful to start curating content. 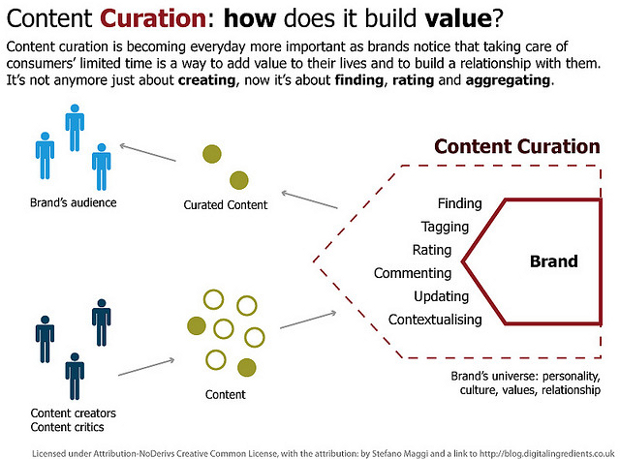 Many brands worry about the cost and time commitment required for effective content curation. They’re already so busy producing content that they don’t have the energy or resources to comb through the content of their peers and set aside time to share it. However, curation doesn’t always have to be a burden placed on top of the creation process. Many brands that aren’t able to scale use curation as a way to engage with audiences without the effort of producing something new. 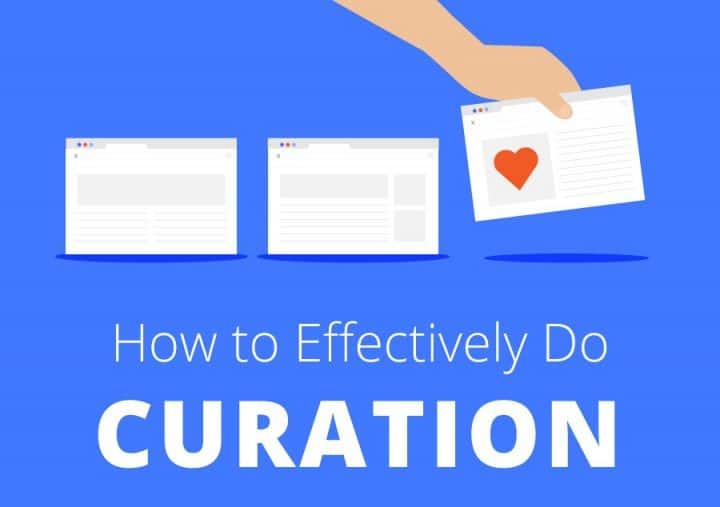 Check out this infographic, How to do Curation, for some of the basics on what to look for in curated content and how to share it with audiences. It will guide you through the process of ideation, calendar building, relationship follow-ups, and long-term measurement, regardless of your company size or industry. Even if you set aside only an hour per week for curation, you can make a big difference in your website’s success. Here are 10 awesome content curation tools in 5 different stages to get in the process step by step. From reading your morning newsletter to combing your own unique insights with curated material. So, let’s get you curating! 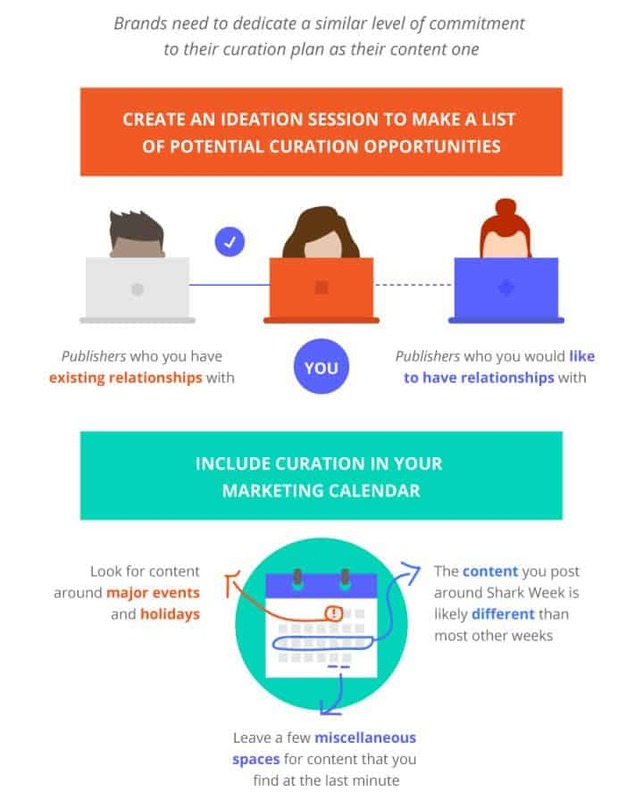 Take a look at the content curation tools. 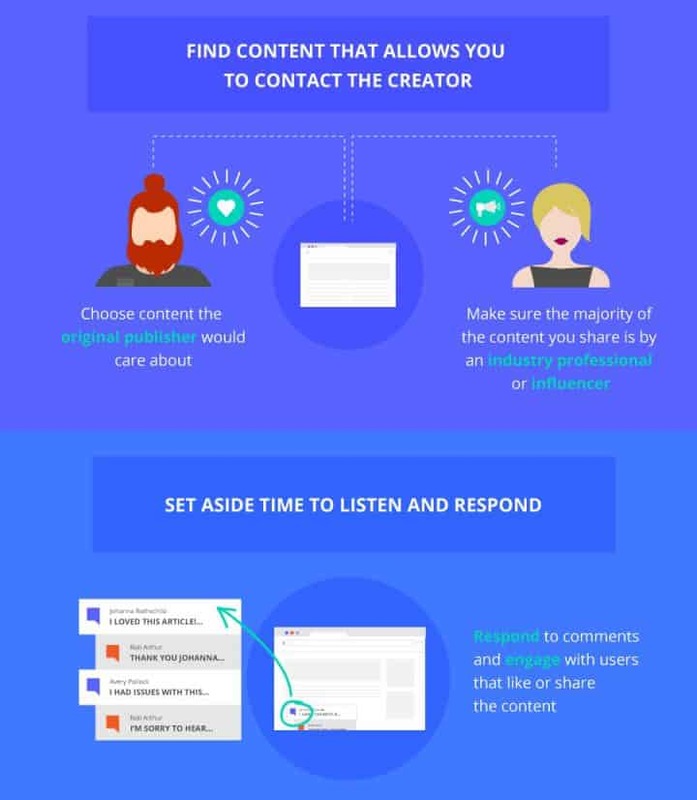 By sharing content on social media, you’re engaging with audiences on their platform of choice. You’re continuing the conversation and positioning yourself as an influencer and thought leader in your field. 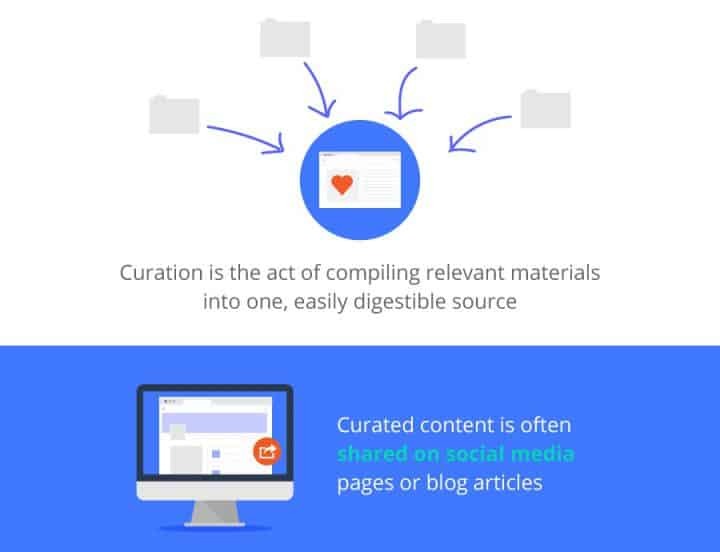 Furthermore, curation allows brands to connect with peers and other publishers that they admire. It’s a quick way to gain recognition and form relationships that can lead to collaboration in the future. 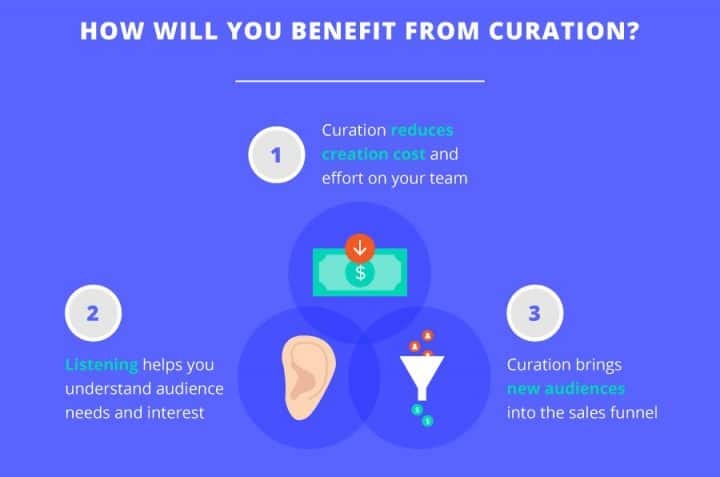 While curation doesn’t take as much time as creation, it requires a strategic effort. Teams should come together for a brainstorming meeting to list potential topics, resources, and opportunities to curate amazing content. Furthermore, the curation process isn’t complete until the original creator is aware that their work has been shared. 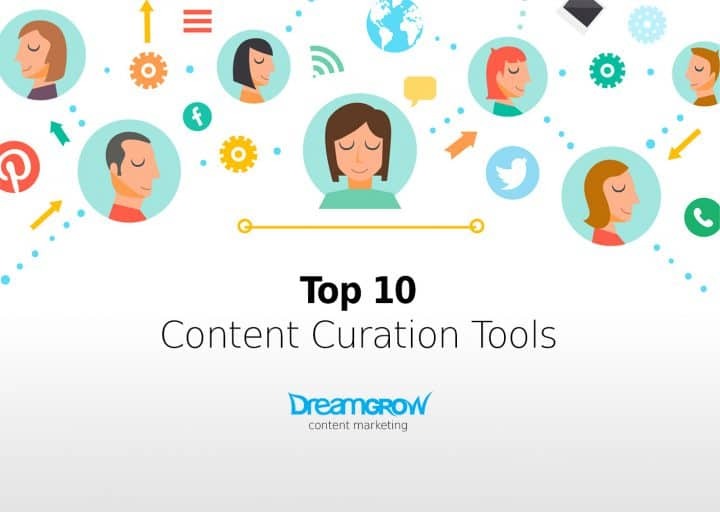 DreamGrow has put together a full Content Curation Starter Kit to get you curating. 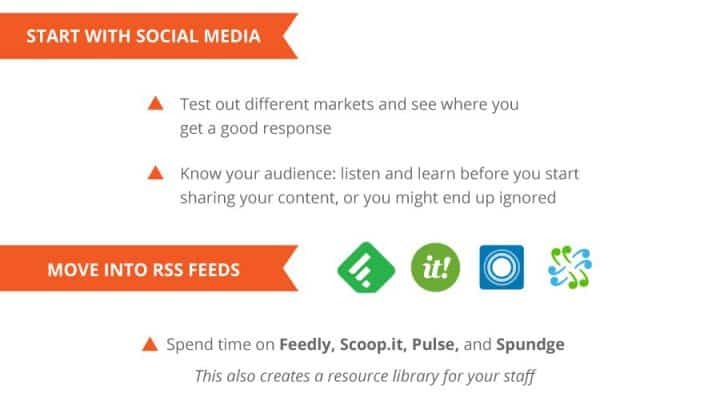 This infographic gives you a quick overview of the two options: social media sites and RSS feeds. Conduct a content audit on your website. Content audit helps to weed out thin content and duplicate pages that hurt your rankings in Google. We wrote you a step-by-step guide how to conduct the content audit. WordPress is the SEO-friendly platform offering plenty of compelling content marketing tools. These tools will help you promote your content on different web platforms with ease. We created the list of 15 content marketing tools that will improve the readability and visibility of your content on search engines. Read our post 15 Great Content Marketing Tools for Your WordPress. Let us know if we forgot to include a great tool you use personally to find or organize your curated content. Liis Hainla is a copywriter and content editor in DreamGrow Digital. Her goal is to help brands fulfill their social media and content marketing aspirations through killer content strategies. She loves animals and traveling, but strongly dislikes pan flute music. Make sure to follow her on twitter @liishainlaDG.